The Focus Paper “An overview of public finance strategies in the 2019 Draft Budgetary Plans of the euro area countries” (in Italian), with data also accessible in interactive format, illustrates the public finance strategies that the euro area countries presented last October, on the basis of which the European Commission published its opinions on the fiscal programmes of the euro area countries on November 21st. In the first part of the Focus, the objectives for the main public finance aggregates contained in the DBPs are compared, especially those relevant to the rules of the Stability and Growth Pact (SGP), for the years 2017, 2018 and 2019. After a brief analysis of the fiscal stance of the euro area countries, the final part of the Focus describes in more detail the strategies laid out in the DBPs of the main euro area economies (excluding Italy), namely Germany, France, Spain, the Netherlands and Belgium, highlighting the divergences from the objectives presented in their Stability Programmes in April and briefly discussing the opinions of the European Commission and the conclusions of the Eurogroup concerning the DBPs. 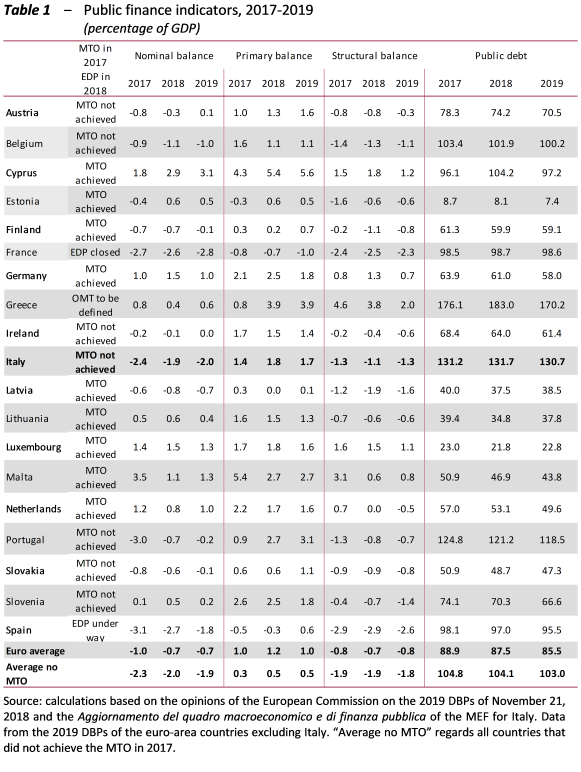 Table 1 compares the main public finance indicators of the euro area countries for 2017-2019 together with the European Commission assessments on the achievement of the medium-term objective (MTO) and the most recent outcomes of the excessive deficit procedures (EDP), based on updated data notified to Eurostat in the autumn of 2018. On average, the nominal deficit of the euro area countries would be equal to 0.7 per cent of GDP in 2019 and 1.9 per cent among the countries that did not achieve the MTO in 2017. The country with the largest deficit target in 2019 is France (2.8 per cent of GDP), while that with the largest surplus target is Cyprus (3.1 per cent). Italy’s deficit target (2 per cent of GDP) in 2019 is the second largest. Average annual nominal balances are expected to improve slightly compared to 2017: by 0.1 percentage points of GDP among the euro area countries and by 0.2 percentage points among the countries that did not achieve the MTO in 2017. The two countries with the largest average annual improvement and deterioration are, respectively, Portugal (1.4 percentage points of GDP) and Malta (1.1 percentage points of GDP). Italy expects to post an average annual improvement of 0.2 percentage points of GDP. The primary balances expected in 2019 average 1 per cent of GDP among the euro area countries (0.5 per cent for countries that did not achieve the MTO in 2017). This year, the country with the largest forecast primary surplus is Cyprus (5.6 per cent of GDP), while that with the largest primary deficit target is France (1 per cent of GDP). Italy’s target for its primary surplus in 2019 is 1.6 per cent of GDP, greater than the average. Average public debt in the euro area is expected to decline from 88.9 per cent of GDP in 2017 to 85.5 per cent in 2019 (and from 104.8 per cent of GDP to 103 per cent in the countries that did not achieve the MTO in 2017). The country with the largest public debt forecast in 2019 is Greece (170.2 per cent of GDP), while the country with the lowest ratio is Estonia (7.4 per cent of GDP). With a target of 130.7 per cent of GDP for 2019, Italy would be the country with the second largest public debt. The average structural deficit among the euro area countries is expected to be 0.8 per cent of GDP in 2019 (1.8 per cent among the countries that did not achieve the MTO in 2017). Greece (at 2 per cent of GDP) forecasts the largest structural surplus in 2019, while Spain is the country with the largest expected structural deficit (2.6 per cent of GDP). Italy’s structural deficit is projected to amount to 1.3 per cent of GDP this year. Changes in the structural balance in the 2018-2019 period are expected to be equal to zero on average among the euro area countries, while the countries that did not achieve the MTO in 2017 are expected to record an average annual increase of 0.1 percentage points of GDP. The budgetary stance emerging from the 2019 DBPs for the euro-area as a whole stands in contrast to that advocated by the European Fiscal Board (EFB) last June, showing an expansionary impulse, albeit one of modest intensity. Although the assessment of the EFB did not take into account the deterioration of the growth outlook that took shape in the following months, an expansionary fiscal stance would still be pro-cyclical, based on the values for the output gap estimated at the end of 2018 by the European Commission, for all the euro area countries, with the exception of Greece and Italy. Among the main euro area countries, Germany continues to over-achieve its MTO in the 2018-2019 period as well. After having lowered its deficit ratio below 3 per cent in 2017, France has been in the preventive arm of the SGP since 2018 and is at risk of some deviation in 2018 and 2019 and significant deviation in 2019 in two-year terms. According to the Commission’s forecast, there would be no compliance with the transitional debt rule in the two years. Following the presentation of the DBP, extraordinary measures that worsened the budget balance were presented and approved. In 2018, Spain is expected to have lowered its deficit/GDP ratio below 3 per cent, according to the forecasts of both the DBP and the European Commission, without however complying with the recommendations of the European Council, which called for a lower deficit than that achieved in 2018. In 2019, Spain is at risk of significant deviation and the transitional debt rule would not be complied with. The budget bill for 2019, presented in Parliament in January 2019, was rejected, leading to the early end of the legislature. In 2018, the Netherlands over-achieved its MTO, while in 2019 the structural balance is at the level of the MTO (according to the DBP) or above it (according to the Commission). Belgium is at risk of significant deviation both in 2018 and 2019. Moreover, according to the Commission’s forecast, the numerical debt rule would not be complied with in either of the two years.